When a chapter 13 case is up for confirmation, the court, the trustee and the debtor must comply with section 1129 of 11 U.S.C. This section deals with confirmation of a plan and it lists all the different factors that must be complied with for the court to sign an order confirming the plan. 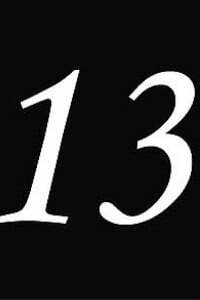 Most debtors and their counsel are aware of the requirements for filing a Chapter 13 in general. Those include completing a credit counseling session prior to filing, submitting the most recent four years of federal tax returns to the trustee, providing the most recent two months prior to filing of pay advices and any subsequent amendments or documentation that the trustee requires post-filing. What is often overlooked is Section 1129(a)(7)(A)(ii) which references a liquidation test or analysis under Chapter 7. The purpose of this section found under Chapter 13 law is to make certain that creditors who are being paid less than their full claim amount are receiving at least the amount that they would receive if said case was liquidated under Chapter 7 bankruptcy laws. The reason why I state that it is often overlooked is that debtors and their counsel are concerned with income, expenses and liabilities and often overlook the asset factor. While it is true that a chapter 13 debtor must put all of his or her disposable income towards the chapter 13 plan, the amount that is actually paid into the plan can be affected by the nature and equity of assets owned by the debtor at the time of filing. For most chapter 13 debtor’s with very little in the way of assets, the liquidation test never causes much of an issue. 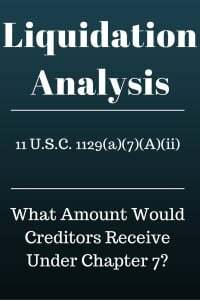 However, when you have a debtor who has significant assets and who is attempting to pay less than 100% back to his unsecured creditors, this section will be raised by the Chapter 13 trustee and it must be analyzed. In a recent example, a debtor appeared in my office who had two significant assets. He had a home owned with his wife jointly. The home had positive net equity of $60,000 after the debtor’s exemptions and cost of sale were factored in. The debtor also had $20,000 on account in a checking account. The rest of the debtor’s property was easily exempted under the Illinois statute which provides for a $4000 wildcard exemption as well as other exemption amounts. In the above example, there was $80,000 of equity available to creditors should the case be liquidated under Chapter 7. This $80,000 figure must be factored into the total amount that must be paid back under a chapter 13. The trustee in chapter 13 is going to want to ensure that the creditors are going to receive a total of at least $80,000 which is the equivalent of what they would be sharing if the case were liquidated under Chapter 7. This liquidation test highlights the fact that debtor’s counsel should not be quoting chapter 13 plan payments without first working up the case. It would be like an accountant looking at your W-2 and advising you as to how much tax you’re going to pay without doing a full analysis and without preparing a full tax return which contains other factors. The same is true with chapter 13 bankruptcy. Now I know that there are firms that are quoting certain plan payments and debtors are leaving their offices with the thought in their head as to what they should be paying. However I caution those debtors as I do other counsel. The only proper way to determine what an estimated chapter 13 plan payment will be is to conduct a full preparation of a chapter 13 case by utilizing specific bankruptcy related software. The software will factor in the liquidation analysis as well as the proper percentage that must be paid back to creditors through the life of the case. These factors in conjunction with the income, expenses, assets and liabilities of the debtor will provide for a realistic chapter 13 plan payment estimate. Without this information, I believe the debtor’s counsel are doing debtors a disservice by quoting or promising chapter 13 plan payment amounts when the documents have not yet been prepared. For more information on chapter 13 and what you would likely have to pay over the course of your plan, you may contact my office at 847-520-8100. We will do a full analysis so that you can rest assured, it’s realistic. We strive to provide excellent customer service and to make the chapter 13 process as painless as possible for our clients.